If there was only one book I could beg you to read this month, it would be this one. The question is this: Why would an all-good and all-powerful (and all-knowing/all-wise) God create or permit a world with so much evil and suffering? This is not merely a problem, but the problem. Not only do atheists raise it, a poll of Christians revealed it is the question people would most like to ask God. I want to be very careful how I word what I'm going to say next. Anytime I hear someone say, "Oh you have to read this book, it totally changed the way I see God/Jesus/Christianity," I see HUGE red flags. No book other than the Bible should do that. Period. Call me whatever you will, but I believe that, in accordance with 2 Timothy 3:16-17, that the 66 books of the Bible as they exist today are fully sufficient for every aspect of our Christian life. However, I do believe that people can create good and helpful study tools, devotional books and topical books that can enhance our understanding of Scripture and deepen our relationship with God and others. This is not only one of those books, it is one of the best I have come across. I don't think it is possible to overstate just how much of an impact this book made on me. I first got the book from the library back in the fall when it came out. I only got through the first couple of chapters. It is big and intimidating, and looks like a textbook: Units divided into chapters with bold-faced introductions for paragraphs. So I took it back and left it. The event that rocked our blog world last March brought me back to it. When Mrs. P lost her husband, I was very shaken up. I was up crying most of the night. Obviously, for her and her daughter. But also because it made some parts of this life we were entering more real to me than they had been before. And one of the things I thought was, "What do I say?" What do you say to someone going through what to me seems like the ultimate loss that isn't cliche, or trite, or even untrue, but still communicates to them both your love and sympathy as well as God's? So I jumped to Amazon and bought the book. It's a big sucker, almost 500 pages (like a say, a textbook!) But suddenly, it had new life to me. The hundreds of stories that Alcorn relates jumped off the page. Families who had lost children, individuals who had gone through prison camps, quadriplegics, cancer victims - all of them painful stories of suffering and loss. I openly cried many times as I read. Or, just to give you an example: when I read non-fiction I always have a pen with me because I like to underline the portions that seem strongest or more impactful. I finally had to give up, because I was going to underline the entire book! It is that good. This book covers a grand sweep of theology. Evil, suffering, good, God's love, sovereignty and free will, Heaven and Hell. As I said before, I can't say that this book changed my view of Christianity. But it did correct some bad theology I had formed over the years. 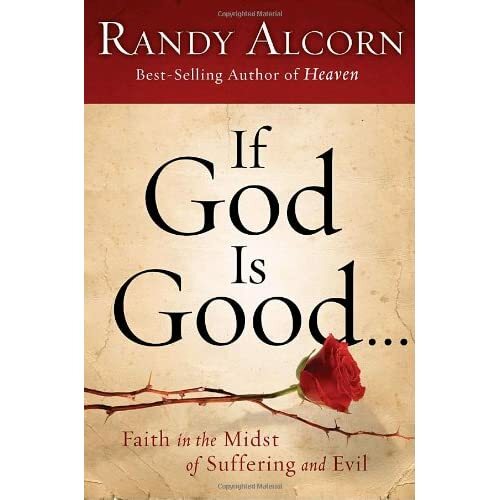 One of Alcorn's main points in the book is that one reason Christians in particular have such a hard time dealing with or discussing the issues of suffering and evil in this world is that our focus is on this world, and not the next. Or, let me tell you one of the stories he ends with. Make no mistake. Jerry didn't come to an end. My old friend simply left his temporary residence, relocating to a better place. One moment he labored to breathe the stale air of Earth, the next he effortlessly inhaled the fresh air of Heaven. His death didn't end our friendship; it only interrupted it. The friendship that began on Earth will resume and thrive in a far better world, the world for which God made us, a world of wonders beyond our wildest dreams. When I think of those we have lost recently - my great-grandmother, Mr. P and others - and I read that statement, it makes me both want to weep and cry Amen! Thank you, Jesus! Because that's the answer. I'm sorry, I can't help but spoil the ending for you. :) It's too good not to share! But about this I am certain: the best answer to the problem of evil is a person - Jesus Christ. In fact, I'm convinced he is the only answer. In this world of suffering and evil, I have a profound and abiding hope, and faith for the future. Not because I follow a set of religious rules to make me better. But because for forty years I've known a real person, and today I know him better than ever. Through inconceivable self-sacrifice he has touched me deeply, given me a new heart, and utterly transformed my life. Because he willingly entered this world of evil and suffering and didn't spare himself, but took on the worst of it for my sake and yours, he has earned my trust even for what I can't understand. I and countless others, mane of whom have suffered profoundly, have found him to be trustworthy. So, I'm thinking I'll have to read this book while Joe is gone. Thanks for reviewing it!! I do the same thing with books: take a pen/highlighter to them. =) So I guess I'll take a hint from you and try not to do that with this book!! This book sounds both intimidating and amazing at the same time. I'll have to look into it! Thanks for the review, and I don't even care about the spoiler, it was great to read. I completely agree with what you said in regards to scripture being the only thing that changes our lives, but christian authors can provide meaningful and helpful tools!!! I have to agree with Skinnie Piggie, it seems very daunting but I am craving to tread it now. There are things that have happened to me in the last year that I don't understand, and as hard as I try not to question, "Why me?" I struggle, stumble, and fall. I love your reviews! I will def have to check this book out. I camn drive myself crazy with the why questions and I know I just need to trust God. Of course, easier said than done. But this book sounds helpful.